I have been patiently waiting for this beautiful kit to arrive so I can finally show you the new McKenna Ryan "Magic in the Moonlight" quilt kit. This kit comes pre-cut (all those little pieces) with the iron-on fusible on the back of every piece. All you have to do is position the pieces, press them in place and then stitch it in whichever way you please. MonoPoly is great for this or you can use all your lovely threads and use a decorative stitch. All the embellishments are also included. 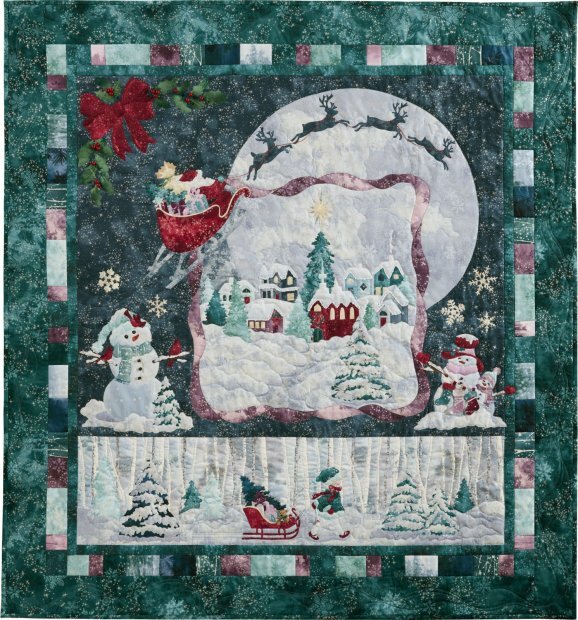 This kit provides you with everything you need to make the complete quilt top including borders and binding. The finished size is 56.5" x 59.5"
This kit is available now - either in one go for $550.00 including postage or over 6 months for $95 per month including postage. If you want to have this over any period of time, please contact me to arrange it. The next Free-motion Feathers workshop is being held on 23rd July and there are only 2 places left. Please book in quickly if you want to be in this class. There will be more later in the year if you do miss out! I will be adding lots of new fabrics to the website over the next few days - it seems to be "order arriving week" here! Please "Like" Lotus Fabrics on facebook as I tend to post pictures of new fabrics there when they arrive. Until next time - Happy Quilting!